Are you getting enough B12 from diet alone? Normally, vitamin B12 is easily attained from foods like fish, meat, poultry, eggs, and milk. But vegetarians or those unable to absorb B12 from food, are likely not getting the amount they need, and may be feeling fatigued. Chew 1 tablet daily. Completely dissolve in mouth before swallowing. If pregnant, nursing or taking any medications, consult a healthcare professional before use. What is the difference between cyanocobalamin and methylcobalamin? 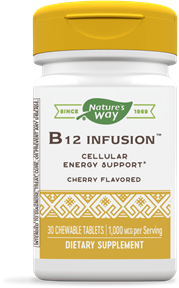 Active B12, methylcobalamin, is considered the most bioavailable form of vitamin B12. “Regular” B12, cyanocobalamin is the most common form of vitamin B12. Cyanocobalamin must be converted to the active form (either methylcobalamin or adenosyl cobalamin) by the body.